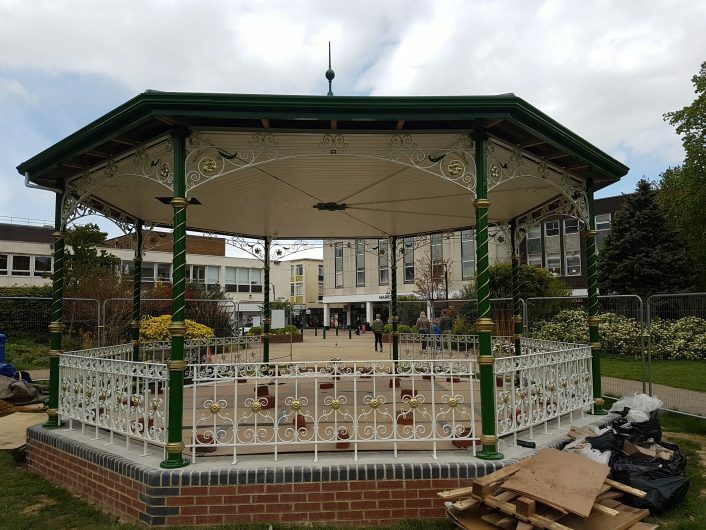 Crawley Town Bandstand – Refurbishment mission complete! To survey, report and restore the remains of the Crawley Town Bandstand, replace missing components (replicating original items), design and manufacture a completely new traditional zinc clad roof. This bandstand originally dated from 1891 wen it was installed new at Gatwick Racecourse. 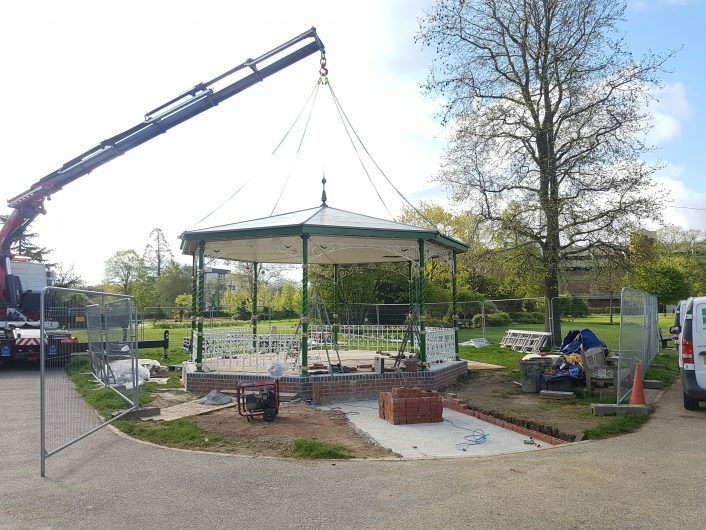 The Crawley bandstand had been completely dismantled several years prior to the inspection of the remaining components by Leander Architectural. It was clear that the roof sections remaining were of a much later design that had been retrofitted to the bandstand in its later years. Upon agreeing the contract, all remaining parts were shipped to Leander and restoration/trial assembly completed in our expansive workshop. All the main support columns were available, although needing refurbishment. 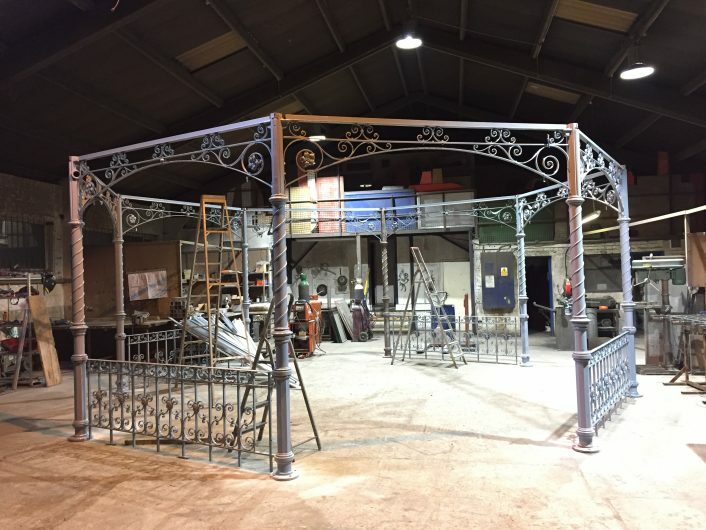 There were several wrought iron balustrade panels missing and the surviving wrought iron spandrels also needed significant repair and replacement of missing items. All surviving items were fully shot-blast cleaned and repaired where necessary. The missing balustrade panels and spandrel bracket repairs were faithfully reproduced by our in-house skilled blacksmith. The roof was replaced by a newly designed structure closely resembling the original, complete with a new finial. This was the clad with aged Zinc sheet and the underside ceiling was timber clad in a traditional manner. Once complete, all items were test assembled in our workshop prior to painting. 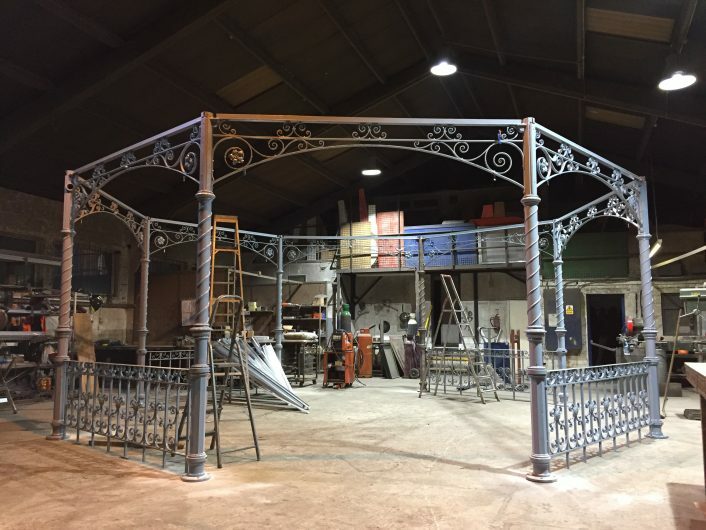 Finally, all items were shipped to site and the bandstand fully installed much to our client’s satisfaction. Feedback from the refurbished bandstands’ first season has been overwhelmingly positive – mission complete!